I would like to replace the sensor / sender, is this a straight forward job? Ignition on but engine not running .. if it reads over 0 bar then 9.5 times out of ten then its a faulty sender unit . I would shop around though .. probably cheaper elsewhere . As per DM, it’s the way to go! Mine was reading 5 bar key in position one, I’ve just had it changed, I was told it was a simple job to replace. I also picked mine up from design911. I think I paid £50 on eBay from one of the well known parts suppliers for a genuine Porsche one (don't think you can get pattern ones anyway). Providing you have a narrow enough crows foot wrench its a very simple swap. D911 do a 'URO brand' part for £41.95+VAT (-discount). I would be surprised if Porsche had their own specific sender unit, it's rather an industry standard part, we need to find out where else it is used. Mind you it isn't very expensive and an alternative part may not be much cheaper. Are there any manufacturer's marks on the old part? I just replaced mine - as said above its very easy, using a crows-foot spanner to reach it from the underside, loosen it, then once unscrew it from the top by hand - obviously remove the two wires first! I paid £55 (incl postage) for a genuine Porsche one (VDO manufacturer mark on the original and the new one) - got it sent by Silverstone OPC. You will need a 19mm crow-foot spanner. As with all tools, you can pay lots or peanuts. I got a cheapo silverline crow-foot spanner set for £12 off Amazon. As I haven't needed them before, so didn't want to spend a fortune, for tools I may only use once. I normally steer clear of cheap tools - these seem ok. Am sure they wouldnt take a lot of use/abuse. 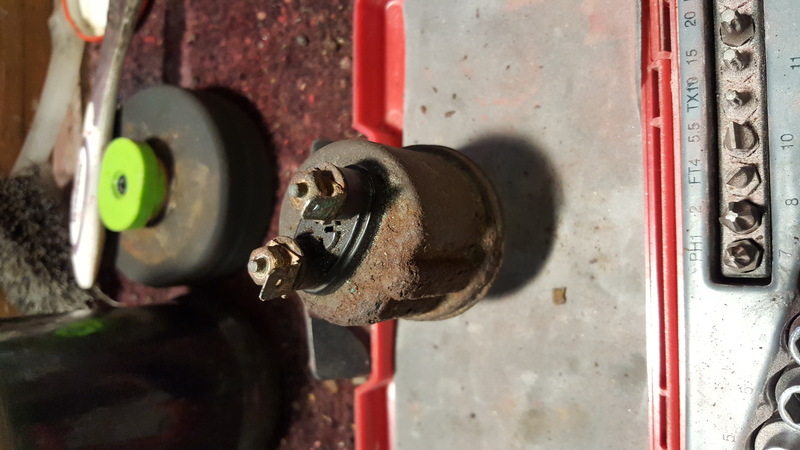 Whilst looking at the sensor from the top I noticed one of the connectors was detached from the sensor. One of the connectors is crimped with heat shrink tubing rather than the OE block connector suggesting some previous connection "issues"
That sensor is for no oil pressure and the oil pressure gauge .. if a wire was unplugged but the gauge reads oil pressure then i assume the no oil pressure side was disconnected ... thats just a light on the cluster . Replace the sensor and see what happens on the gauge .. its normally just this . Heat shrink fix .. normally done as the wire is starting to come out of the connection (bare wires at the top of the connection ) .. you can replace the connection or heat shrink as in this case . Having never had a working gauge what should a good one show on start up ? What reading are you getting now from the new sender?